Ask The Champ: How Has Technology Helped You Succeed? 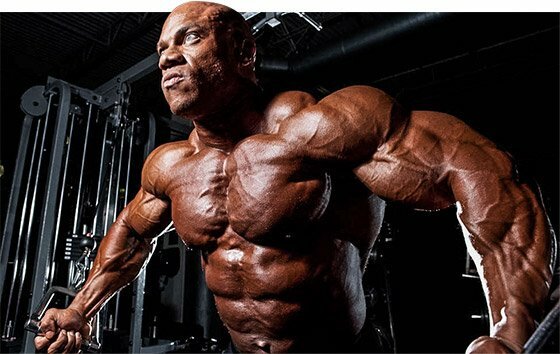 Science and innovation have been a huge part of Phil Heath's three-year reign as Mr. Olympia. Learn more about how technology has improved his training and nutrition! Hey Champ, what role do science and technology play in the world's top physique? Science leads to innovation, and innovation plays a huge role in the fitness industry. Take gym equipment, for example: there are exercise machines available now that can help isolate very specific muscles. Before technology brought those machines into existence, you could only hit those muscles or muscle groups secondarily with compound movements. Because of these great advancements, I can make really specific changes to my physique that just would have been impossible even 20 years ago. Science also plays a huge role in the supplements I consume. Experts and scientists constantly study and test new ingredients for health benefits. Every competitor is trying to put forward his or her best presentation. In order to keep up with or stay ahead of the field, we need cutting-edge supplements to constantly improve as our physiques do. I do my best to keep abreast of all the research and development happening in the industry, but I have a busy schedule and I travel a lot. I rely on the expert researchers at Team MuscleTech to inform me of the latest trends or breakthroughs in ingredients or products. It would be unfeasible for me to do what I do without a great team around me. I have experts and scientists on my team, so I'm a little better educated than most people. If you're not sure how to supplement, I don't think it's smart to blindly take something just because somebody tells you it will give you an edge. Do your own research so you're the one making decisions about what you do with your body. Although technology plays a huge part in my training and nutrition regimen, I found that staying consistent in my programs has been the most effective way to stay on top of my game. I make minor changes here and there, but the biggest impacts on my programs come from the mirror and input from my coach. When I look at myself with an unbiased eye, I can tell exactly what parts of my physique need improvements. I also trust my coach to know where I should be and what my competition looks like. I think a lot of people think that bodybuilding is just about putting on a lot of muscle. But, really, it's much more complicated than that. When it comes to improving my physique, I always remind myself about the importance of maintaining symmetrical proportions as I add size. It's not about being the biggest guy; it's about having the most quality physique. I can be the biggest guy on stage, but if I'm not balanced or symmetrical, I'm not going to win. "When I look at myself with an unbiased eye, I can tell exactly what parts of my physique need improvements." My supplementation regimen is also really consistent. My workouts are hard and heavy. There's nothing easy about the way I train, so it's important for me to maintain energy throughout my training sessions. I want to make sure I hit every muscle group with intensity and focus. To help me do that, I use AminoBuild through my workouts. The formula is loaded with BCAAs and a high dose of betaine. I find it really helps with my recovery and keeps my strength at peak levels—plus, it tastes amazing. As technology continues to impact the sport, I think it may actually bleed into how competitions and judging work. Bodybuilding is a subjective sport. Yes, judges are trained, but it's hard for the judges to see everything they need to see—that's just part of being human. I think it would be pretty cool to have some type of 3D body scan done before stepping on the stage that would send all your measurements and body composition to the judges. With that information about symmetry, proportion, and conditioning, the judges would have an even better way to objectively assess the people they're looking at on stage. Performance, stage personality, and posing would still play a critical role, but those numbers could take away some of those subjective opinions that add a lot of controversy to bodybuilding. In reality though, something like a body scan is probably decades away. And even with it, there will still always be a subjective component to judging competitions.